The Society of Automotive Historians found Battle for the Beetle so compelling that it presented Ludvigsen's work with the Society's highest award for a book. At the Annual Meeting and Awards Banquet this past October, the Society awarded Battle for the Beetle The Nicholas-Joseph Cugnot Award. 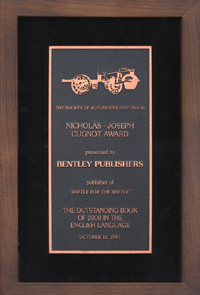 The award is presented to the book "which represents the most outstanding writing and original research in automobile history." In presenting the award, SAH Secretary Michael Berger called Battle for the Beetle "an exemplary piece of scholarship," while another declared: "To my mind this book is automotive history at its best." Berger continued, stating that: "In sum, Battle for the Beetle is fascinating and captivating for anyone interested in automotive history or, for that matter, the history of the era within which the Beetle was created." Unquestionably, Battle for the Beetle is one of the most readable and fascinating books to come along in years.